This is an In Person Signed C.D. Insert for Wind It Up by Gwen. The C.D. is present and it comes in the original plastic case. 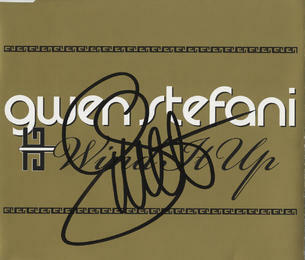 Gwen Renée Stefani born October 3, 1969) is an American singer-songwriter and fashion designer. Stefani is the lead vocalist for the rock band No Doubt. Stefani recorded her first solo album Love. Angel. Music. Baby. in 2004. The album was primarily inspired by music of the 1980s, and emerged a success with sales of seven million. The album's third single "Hollaback Girl" was the first U.S. digital download to sell one million copies. Stefani's second solo album, The Sweet Escape (2006), yielded "Wind It Up", "4 in the Morning" and the highest-selling single "The Sweet Escape". Including her work with No Doubt, Stefani has sold more than 40 million albums worldwide. She won the World's Best-Selling New Female Artist at the World Music Awards 2005.